But when you look at Snead’s swing, which he taught himself hitting rocks in the fields of Virginia, I would challenge you to find a better swing, period, let alone a better self-taught swing. Of course, because he learned it by himself, it was a Classic Golf Swing action, because that is what you will do when learning how to swing naturally. 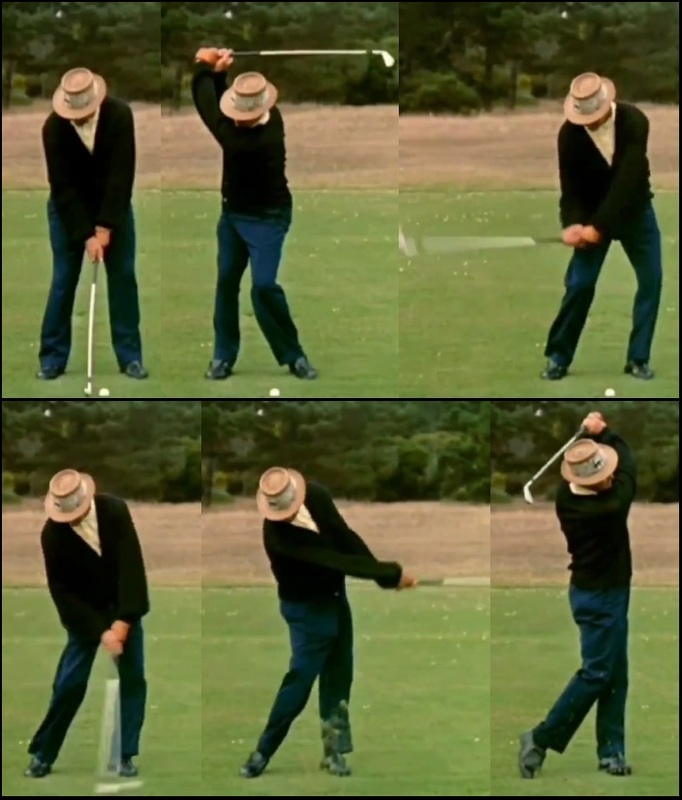 What some swing “gurus” might call “a little flippy,” is the proper mechanical action for releasing the club down and through – and this “flippy” action got Sam Snead 82 PGA Tour victories, including his last Tour win at the age of 52, meaning it was after this swing was shot on video! All in all one of the greatest all-time swings and by far the greatest self-taught swing action you will ever see. … and simply taking out their personal idiosyncratic things – what was left over was the model. You will find all of the greatest swingers swinging more or less the way the MCS Golf Swing model has been built – because motion is motion and the principles of motion are universal. He had longevity for sure. I don’t know that even other players who had good swings had that kind of longevity, nor dominance for as long as he played. Most of my swing is self taught, so most of my mechanics are extremely similar to MCS. What killed my swing was the planted heel, and center bias, which I’m still in the process of removing from habit. Every now and again I find I get back to center bias and a planted heel, because it’s ingrained in muscle memory. I only swing maybe 4 times a week for 30 minutes a day, so it’s tough to get it down. But it’s getting there. But Sam being self taught with a swing like that is insane, and I not only admire his swing but his career. He was one of a kind. I remember him doing the ceremonial tee-off with Gene Sarazen and Byron Nelson on Masters Thursday back when the 3 of them could still do it, in the late 90’s, and when I was new to golf. Imagine modern swingers trying to swing a club in their 80’s! Curious how many people are beginning to take to the classic swing. You’re seeing it more and more on tour as more people do it, and I would make a prediction for the next golden age of golf IF every tour player adopted the classic swing. Might be another 15 years, but we’ll see. I hope it doesn’t take that long! The fact is that it will have to come back because it’s proper mechanics, whereas the Modern convention is under fire and a flawed concept that never should have last this long to begin with. But sooner is much better than later, for the sake of those still being taken in by it. Besides setup, is there anything in his swing that you would improve? I wouldn’t have touched that swing with a ten-foot pole, Brandon! However if someone with that exact same swing action had asked me my opinion, I might suggest a little more spine tilt on the setup. But really, you won’t see better mechanical action than that from anyone, even Nicklaus. Sam didn’t drive the legs like Hogan or Nelson. But he was still the more powerful of the three. Brandon and Mr. McJohn – correct, very quiet looking legs, because of that action you see in MMJ’s down-the-line view of Snead here. Look at the right leg extension on the pivot and the nice tight top position. That is leverage personified, and if you do it properly, you don’t have to “drive” the legs. When you get that much “swinging gate” with the leading knee and that nice right leg extension, the simple shift of weight to the leading foot creates all the leverage you need, and more. I’ll do a little more of Snead in the future if you all are interested in it. But look at the stance, the pivot, the motion down and through – MCS stands for Mechanically-Correct Swing, remember – and Snead’s was that – in spades!